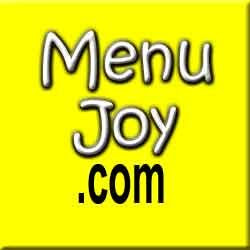 I was recently told by a popular blogger that we should feature more local restaurants. After all, we are from Fall River. Why not showcase some of the fabulous places to eat in the city? Well, although we agree with him, we at New England Bites like to visit a lot of different cities in order to find the perfect meal. After reading rave reviews on Roadfood about two delicious-sounding places in Gloucester, Mom and I decided to hop in the car and take the almost two-hour drive to America's first seaport. 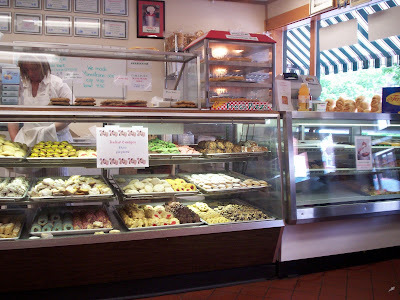 The first place on the list was Virgilio's Italian Bakery & Deli - home of the world famous St. Joseph sandwich. After slinking around a few tight streets, we pulled into a metered parking space nearby at around 2:15 p.m.
Named after Saint Joseph, who Sicilians believe had saved the nation of Sicily from famine, this popular sandwich seems to be everyone in Gloucester's cure for hunger pangs. 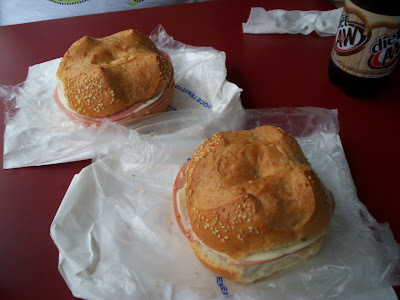 Virgilio's Bakery was filled with people requesting the St. Joseph in both the original form or filled with various vegetables. 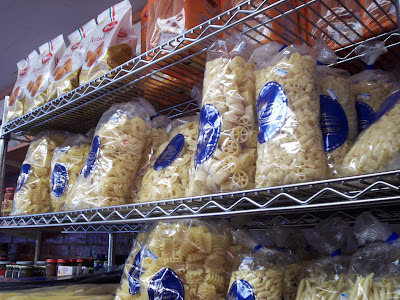 When Mom and I walked in, we saw that the market area that we had heard about online was smaller than we anticipated, but filled with several imported Italian foods like the expensive Maestri pasta noodles and several jarred sauces. While Mom was ordering our sandwiches at the deli counter, I was able to sneak a picture of Virgilio's case of beautiful pastries. Mom placed an order for two St. Joseph sandwiches ($4.75 each) and two bottles of diet root beer ($1.50 each). Our total came to $12.50. Since there were only one or two tables inside, and the place was filling up with hungry, frazzled patrons, Mom and I decided to take our lunch to one of the outside tables. I grabbed the soda bottles, and I thought she grabbed the sandwiches. After wiping down the table with a Wet Wipe (we always carry those in case of an emergency), I put the sodas on the table and looked for the sandwiches. Lo and behold, she thought that I took the bag, and I thought that she took it. Needless to say, the bag of sandwiches was sitting pathetically on the counter when I went back in - embarrassed as could be. Now, aside from forgetting the sandwiches at the deli, this was a big day for Mom. The only sandwiches she eats are turkey and ham. She never gets an Italian sub. However, due to Michael Stern's awesome description of the famous St. Joe's, she decided to try one. The sandwiches were served on a bulky roll and consisted of Genoa salami, German bologna, mortadella, cooked salami, imported Provolone cheese, and an oil and oregano spice mix. At first, Mom was surprised because the sandwich didn't look like it did in the picture on Roadfood. In the photo, the sandwich was served on a long sub roll. You can ask for it that way, but the price difference is $.75 more, and we didn't know that at the time. Looks aside, Mom took a big bite and thought it was really tasty. Besides the very fresh meats and roll, Mom thought the oil and spices really kicked up this sandwich. She's had Italian sandwiches in the past (although I've never seen her eat one), and due to the variety of meats, the flavor is always very good. However, the spices on the famous St. Joe's really put it over the top made and it very special. As for me, I too thought that the oil and oregano blend really distinguished this sandwich from other Italians subs I have eaten before, but all in all, the flavor was quite familiar. 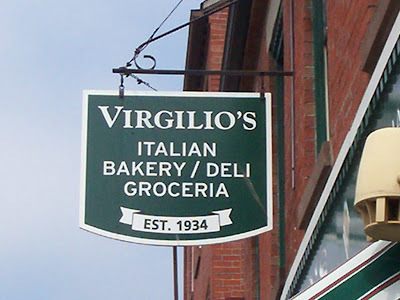 If you've ever eaten an Italian sub from Marzilli's Bakery in Fall River, than you've eaten a St. Joseph sandwich from Virgilio's without the added spice and on softer bread. It is so nice to know that, although Gloucester doesn't have a Marzilli's, they have a Virgilio's to fill their Italian sub needs. However, I will say that if Marzilli's were to add the Virgilio's spice mix to their grinders, I would probably overdose on sandwiches almost immediately. Before leaving the city, we decided to get a St. Joseph sandwich to take home to Dad ($4.75). 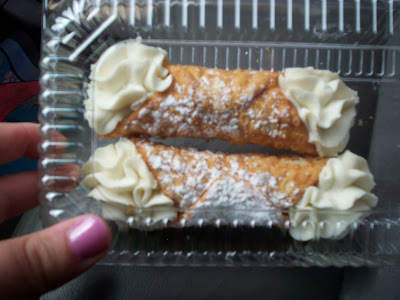 When I went back in, the allure of the freshly filled cannolis was just too much for me, so I bought a couple to bring home ($2 each). My total came to $8.75. After being overjoyed with the surprise purchase, Mom quickly stuffed the new goodies into our freezer bag so that they would be in perfect shape when they arrived home ... although sadly, one cannoli didn't make it. We cracked that baby in half and ate it before we even got back on Interstate 95. The first thing Mom noticed about it was the size. It definitely had a longer shell, which leaves plenty of room for more fabulous filling. The shell was crisp without being so hard that it exploded when you took a bite, and the cream was made of sweet, creamy ricotta and had an excellent taste. Only a light dusting of powdered sugar topped off this excellent treat. We brought the lone cannoli survivor home to Dad as a chaser for his St. Joe's sandwich. After spending almost an hour caught in Boston traffic, we arrived home. Thanks to the freezer bag, the food remained just as it was when we left Gloucester. Dad was happy to try his sandwich and cannoli from Virgilio's. At first he thought the bread was too chewy, but he soon grew into it after he realized that all Italian bread has a little bit of chew to it. He enjoyed the combination of meats and also thought that the added spices gave it a real zing. As for the cannoli that did make it home, Dad thought it was delicious. He ate the whole thing, which is unusual for him because he often finds that type of pastry too sweet. He really enjoyed the ricotta filling because he thought the cannoli was just filled with whipped cream. It was the perfect ending to a great meal. Other than the St. Joseph sandwich, Virgilio's Bakery sells homemade breads such as Italian scala, semolina, ciabatta, St. Joseph rolls, Anadama, and multi-grain. They also sell pizza by the slice ($2-2.25), their own homemade bread dipping oil and marinara pasta sauce, and several cold and hot sandwiches including the Eggplant Supreme ($5.50-6.25), the chicken St. Joseph ($5.50-6.25), and the Porky Joe ($6.25), which is oven-baked pulled pork tenderloin simmered in tangy barbecue sauce. Party trays are also available for special events. 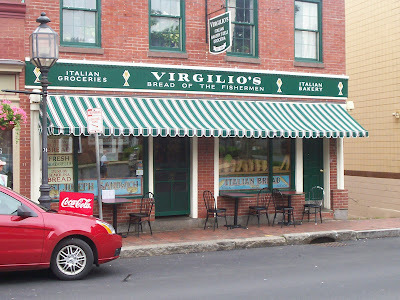 Mom and I really enjoyed visiting Gloucester, and eating at Virgilio's Bakery made our trip extra special. I did learn one very important lesson - although traveling and trying different foods is a lot of fun, sometimes the one thing you're looking for can be found right in your own backyard. "There's no place like home ... there's no place like home ... click, click, click ..."
Virgilio's Italian Bakery & Deli is open from 8:30 a.m. to 5 p.m. Monday through Saturday. They are closed on Sunday.